First Line: Five hundred kilos of white death snaked through downtown Phoenix. 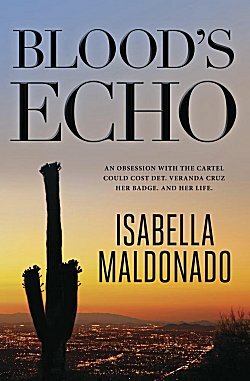 Detective Veranda Cruz has spent years learning all there is to know about the Villalobos drug cartel. Now she leads an elite task force on the Phoenix Police Drug Enforcement Bureau. No one suspects Cruz's obsession with the cartel until an operation goes spectacularly wrong. Targeted by an increasingly unstable drug lord, Cruz must protect her family and avoid adversaries within the police force while she tries to set another trap, this time as part of the Homicide team. Blood's Echo is a fast-paced juggernaut of a thriller led by a strong, interesting woman. While Veranda Cruz tries to bring down one of the most powerful drug cartels in the world, readers learn quite a bit about family dynamics-- both within Veranda's large and caring Hispanic family and the drug cartel itself. Veranda and Cole Anderson, the arson investigator, are the strongest characters in the book, and while the secondary cast is good, it's not as developed as these two. I look forward to seeing other characters fleshed out as the series progresses. Maldonado is good with action scenes. Anything to do with bringing down the cartel and the search for a possible mole within the police department is exciting and fast-paced. All in all, I enjoyed reading this first Veranda Cruz mystery set in Phoenix, Arizona, and I'm looking forward to others. This one really sounds like a potent sort of thriller, Cathy. The setting interests me, too. And I do like it when thrillers also have fleshed-out characters. Glad you liked this one. It will be interesting to see what the author does in her next book. Drug cartels aren't my thing either, Kay!